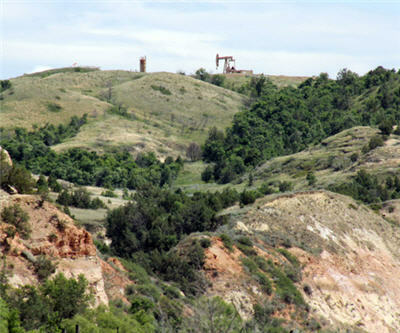 Theodore Roosevelt's ranch in the badlands of North Dakota where the "restorative power of wilderness" made a "lasting impression" on the 26th president of the United States is being encroached on by industrialization due to the state's fracking oil boom. NPR reports the "contemplative seclusion" of the Elkhorn Ranch often called the "Walden Pond of the West" will be "ruined" by a proposed gravel pit just across the Little Missouri river and a new bridge. "[Roosevelt National Park Superintendent Valerie] Naylor points out the old hand-dug well and the ranch house's massive foundation stones cut from granite. But that's all that's left today. "That is one thing that's so special about the Elkhorn Ranch. We don't have anything that's reconstructed here," she says. "We just have a site. And it's the way that it was, for the most part, when Roosevelt first found it in the summer of 1884." "That Elkhorn Ranch site is surrounded by people that own mineral rights," Arthaud says, "and it's going to get developed." There's pressure on President Obama to declare the surrounding area a national monument, an executive order tool often used by Roosevelt and more recently by Bill Clinton. If that should happen, Arthaud says, the locals would raise hell and do everything in their power to reverse it.